Although lifestyle changes are an essential first step in treating coronary artery disease, you may need to take medications to reach your cholesterol and blood pressure goals and otherwise reduce your risk. In fact, most people with heart disease need to take more than one medication. The specific combination of drugs will depend on your particular symptoms and risk factors. Some of the most commonly prescribed medications are described below. For many years, doctors used diuretics — sometimes known as water pills — to treat high blood pressure. Although diuretics remain a mainstay of blood pressure treatment because they are cheap and effective, a flood of other drugs have become available since the 1980s. In addition, a large meta-analysis comparing the various options concluded that the five categories of drugs currently available are equally effective for most people. Work with your doctor to determine the best type of medication for you. It is important to keep in mind, though, that most people with hypertension do not get their blood pressure under control with the starting dose of the first drug chosen. At that point, two philosophies exist about what to try next. Some doctors increase the dosage of the first drug to see if it will bring blood pressure down to target levels. The advantage of this approach is simplicity, as the person being treated takes one pill per day. A second approach is to use low doses of two or more blood pressure drugs that work in different ways. This approach minimizes the likelihood of side effects, but may be harder to follow, as it requires taking two or more pills per day. It may also be more expensive for the person being treated, as he or she may face additional copayments or out-of-pocket expenses for the drugs. A compromise approach is to use combination medicines that include, for example, both an ACE inhibitor and a low-dose diuretic. This is convenient, but many combinations are available only in brand-name forms and are thus more expensive. Thiazide diuretics work by reducing the amount of water in the body and increasing the flow of urine. These medications are often prescribed as initial treatment for people with hypertension, either alone or in combination with another blood pressure medication. Many are now available in generic form, which means they are inexpensive. Commonly used thiazide diuretics include chlorthalidone (Hygroton, Thalitone) and hydrochlorothiazide (Microzide, HydroDIURIL), although there are many others. Diuretics can boost the effectiveness of other antihypertensive medications, so you benefit more from multidrug therapies. But diuretics do have some drawbacks. If you have trouble with urination, diuretics may aggravate the situation. These drugs can also lower potassium levels (possibly causing leg cramps), although potassium-sparing diuretics are available. Finally, diuretics can cause fatigue. Even with all the caveats, however, diuretics provide the foundation of treatment for high blood pressure. These blood pressure drugs dilate blood vessels. They work by blocking production of angiotensin, a blood vessel–constricting protein. In addition to controlling high blood pressure, ACE inhibitors have long been prescribed for people with heart failure. Studies have shown that these drugs also help in other situations. They help to preserve heart function after heart attacks, protect the kidneys in people with diabetes, and slow the progression of atherosclerosis. The most common problem is a persistent throat tickle and cough. Angiotensin-receptor blockers (ARBs) provide an alternative to ACE inhibitors. ARBs work in a slightly different way from ACE inhibitors to restore normal blood flow: Instead of blocking production of angiotensin, ARBs prevent this protein from exerting its blood vessel–constricting effects in the body. One of the great medical success stories of our time is the ability to diagnose and treat heart disease and to gauge a person's risk of developing it in the future. But preventive measures and therapies can only be successful if people use them. A continuing medical challenge is helping people avoid a variety of common pitfalls: ignoring key symptoms, deferring recommended tests, or neglecting to take medications as prescribed. Any or all of these things can keep you from reaping the full benefit of decades of medical research and practice. "The drugs worked. Can I stop now?" If you've reached your target blood pressure or cholesterol level, it's tempting to stop taking your medicine. But doing so can cause your blood pressure or cholesterol to rise again — along with your risk for heart disease. Check with your doctor before deciding to cut back or eliminate any medication. Tell your doctor about side effects that you find bothersome. Chances are, you can use a different medication that's more bearable. One of the best ways to minimize unpleasant side effects from heart medications is to avoid taking other drugs that interact adversely with them. Many drugs commonly prescribed for the prevention or treatment of heart disease should not be taken with other medications. Ignoring chest pain is another common pitfall. Most people know that it might be a sign of angina or heart attack — or of nothing more than indigestion. But anyone having chest pain should err on the side of caution by calling the doctor and having an evaluation for heart disease. If you disregard chest pain or pretend it's not that big a deal, you could be denying yourself the chance for early — and potentially lifesaving — treatment. Beta blockers are commonly used in people with coronary artery disease. While they were once considered an important blood pressure medication, they are now regarded as less effective at controlling blood pressure compared to other drugs. There are many types of beta blockers on the market, but all act by interfering with epinephrine (adrenaline), a hormone that normally stimulates the heart to beat faster and stronger. Beta blockers slow the heart rate and decrease the amount of work the heart must do. By lowering the oxygen needs of the heart, beta blockers help prevent or relieve angina symptoms and minimize damage during a heart attack. When a person first starts a beta blocker, he or she may notice fatigue and a sluggish feeling. Over time these symptoms tend to be less prominent. Beta blockers used in heart disease are called selective beta blockers, such as metoprolol (Lopressor, Toprol XL). Calcium-channel blockers are vasodilators: By dilating the coronary arteries, they increase blood flow to the heart and cut its workload by reducing blood pressure and the force of the heart's contractions. They are excellent anti-hypertensive medications, especially amlodipine. Since statins were first introduced in the late 1980s, they have become the treatment of choice for lowering cholesterol, simply because they are so effective. Even so, they don't work for everyone; other medications are available to lower cholesterol and may be more beneficial for you, depending on your circumstances. If you have high triglycerides in addition to high LDL, for instance, the class of drugs known as fibric acid derivatives may help (see "Fibric acid derivatives"). If you have low HDL cholesterol, niacin is an option. Other medications such as colesevelam (WelChol) and ezetimibe (Zetia) lower LDL substantially and can be combined with statins to lower these levels even further (see "A cholesterol-lowering combination"). 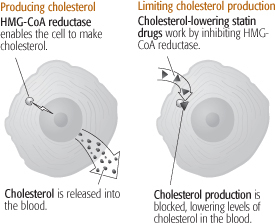 Statins, known medically as HMG-CoA reductase inhibitors, work by preventing the liver from making cholesterol (see Figure 8) and by forcing the liver to draw LDL cholesterol from the blood. These medications not only significantly lower LDL levels but also improve your overall cholesterol profile by lowering total cholesterol, slightly boosting HDL, and slightly lowering triglycerides — although by differing amounts. Since they were introduced in 1987, the statins have proved to be better at reducing cholesterol than other medications. What's more, studies have revealed that these medications have other benefits: They stabilize cholesterol-filled plaque in artery walls, promote the growth of new blood vessels, and calm inflammation. All of these actions help to reduce the risk for coronary artery disease and heart attack or stroke. Small wonder that statins are considered one of the most important advances in drug therapy since the 1970s. Most of the cholesterol circulating in your blood has been made by your liver, not digested from the food you eat. An enzyme called HMG-CoA reductase plays a key role in deciding how much cholesterol the liver makes. But statins are not miracle pills, and they're not for everyone. They don't always lower cholesterol enough, and they cause troubling side effects in some people. It's also important to remember that eating healthy foods, exercising regularly, and losing weight if necessary are the best — and should be the first — approaches to treating high cholesterol and reducing the risk for heart attack or stroke. Consider the options carefully and talk with your doctor about whether to take a statin and, if so, which one to take. Should you take a statin? It depends on a number of factors. In general, the higher your LDL cholesterol, and the greater your chances of having a heart attack or stroke, the more you'd benefit from taking a statin. Examples of available in the United States include atorvastatin (Lipitor), fluvastatin (Lescol), lovastatin (Mevacor), pravastatin (Pravachol), rosuvastatin (Crestor), and simvastatin (Zocor). Another medication, Vytorin, combines ezetimibe and simvastatin in a single pill (see "A cholesterol-lowering combination"). In most people, statins have similar benefits and similar side effects. Which statin you take isn't nearly as important as whether you take it every day, how you take it and how well you help it along with diet and exercise. Aching muscles is the most common side effect of statins. Severe muscle damage — a condition known as rhabdomyolysis, which can be deadly unless treated — affects about 8 of every 10,000 people taking a statin. Because various statins are broken down in the liver in different ways, some statins are more likely to be affected by other drugs or foods. Grapefruit juice, for example, increases blood levels of Mevacor, Zocor, and Lipitor, but doesn't usually affect the other statins. Your doctor may suggest a particular statin based on other medications you are taking. Take some statins at night. It's best to take Mevacor, Pravachol, Zocor, and Lescol with your evening meal. That's because these statins block a key cholesterol-making enzyme in the liver that is most active at night. Lipitor and Crestor last long enough in the body that it doesn't matter when you take them. Beware of drug interactions. Mention all other medications you are taking when talking with your doctor about a statin, to avoid potentially harmful interactions. If you are on other medications, you may want to try Pravachol, which is less likely than the other statins to interact with other medications. Zetia works by blocking the cholesterol in food from crossing the intestinal wall and getting into the bloodstream. Zetia reduces LDL levels about 20% alone; studies show that when combined with a statin, it lowers LDL another 15%–23%. Talk with your doctor about whether a combination strategy might be helpful for you, particularly if you have not responded dramatically to a statin alone. Aspirin is an old standby, yet it continues to surprise. This common, inexpensive drug helps protect survivors of heart attack and stroke from subsequent heart attacks and death, and even helps reduce the number of deaths that occur within the first hours following a heart attack. Aspirin is an antiplatelet drug that prevents tiny blood cells known as platelets from clumping together — the first step in the formation of a blood clot. In recent decades, many new heart drugs have been introduced, but they haven't undercut the importance of nitroglycerin and other nitrate compounds. For more than a century, these drugs have been the most important medications for treating coronary artery disease. Nitroglycerin is best known as the little white pills that people carry with them and slip under the tongue when they have bouts of chest pain. Nitrates help prevent or stop ischemia in several ways. They relax the muscles in the walls of the blood vessels, causing arteries and veins to dilate. When the coronary arteries dilate in response to nitroglycerin, the heart's blood supply increases. Nitrates also reduce the heart's work by lowering the body's blood pressure and the pressure within the heart's chambers. As a result, the heart requires less oxygen and places fewer demands on the coronary arteries. Because nitrates dilate blood vessels throughout the body, they can cause a wide range of side effects, such as headache, dizziness, and even fainting spells. When people first start taking nitroglycerin, they are usually advised to sit down to avoid falling. Sitting is better than lying down because raising the legs to the level of the heart causes more blood to flow to the heart, increasing its workload.